Don’t you just hate when inspiration strikes at 7:41am when you are sitting at your work desk? Luckily I have an awesome coworker and friend who I can bug across the aisle, “Ashley, can you listen to my novel idea?” We look at each other with data-glazed eyes and talk about creative ideas and the light of humanity begins to shine again. I am so grateful for my day job of project management and scheduling that affords me the money for my house, bills, and fun on the weekend. Although when that writers itch begins it’s hard to focus on the Excel sheet in front of me. In fact, I just want to run from the building, jump in my car, and drive home to my novel. Why do the waves of urgency hit at the most inopportune places/moments? I document my thoughts, but by the time I get home the rush has left, and I am stuck with uninspiring notes. I’m asking writers out there, how do you schedule the time and more importantly the inspiration (as if it can be scheduled) into your 40 hour/week career schedule? The Fisherman and His Wife is a classic story of greed and not knowing when to stop.The story begins when a fisherman releases a trout back into the ocean because the trout is actually a bewitched prince. Upon hearing what her husband did, the fisherman’s wife (Ilsebill) demands that her husband requests the trout’s help for a nicer house. The requests become more and more extravagant, until Ilsebill wants to be “like God” to command the sun and moon. When the fisherman requests that his wife be “like God” the trout says, “Well, then. Go home. She’s sitting back in your hovel again.” This tale will make you reflect on need vs. greed. I found myself thinking of all of the blessing already in my life when I finished this story. The drawings in this story are by Wanda Gag, 1936. 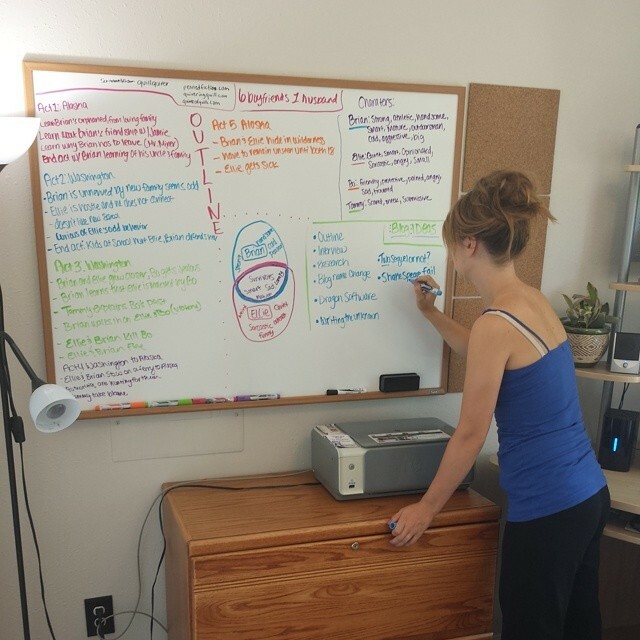 After reading Dockett’s article I rushed out to Office Depot and bought a new white board and went crazy for an hour, getting an overhead view of the structure of my story. So here I am, BIG outline made, now I just have to break it down again a few more layers. I am going to keep dissecting until I have an outline for each chapter. For my 27th birthday my husband Miles bought me “The Fairy Tales of the Brothers Grimm” edited by Noel Daniel and translated by Matthew Price. Published by Taschen. The collection begins with a wonderful introduction by the editor Noel Daniel about the history of Jacob and Wilhelm Grimm. I didn’t know that the German fairy tales were not actually written by the Grimm brothers (although there was an extensive amount of rewriting), but they were collected, edited, and translated by the brothers. 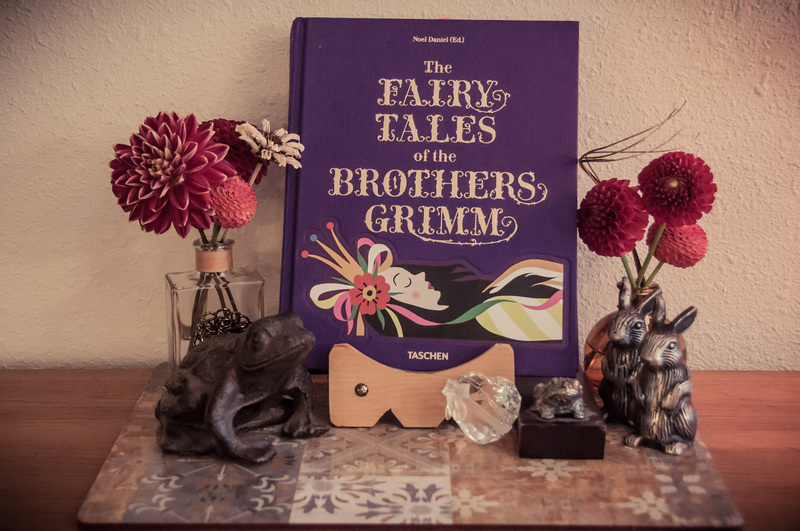 The Grimm brothers originally targeted the tales for scholars, but noticed over time that they had a split audience and children were enjoying the stories just as much as the adults.The collection was then tailored towards a younger audience. The edition I was gifted was derived from 1857 when they released their “child-friendly” version. Aside from the 27 charming stories the book contains, the illustrations that accompany each story are enchanting. Through various mediums, the stories are brought to life in a Büffet of illustrations ranging in dates from the mid 1800’s to mid 1900’s. I am going to pick and choose a few of the tales to review in forthcoming posts. 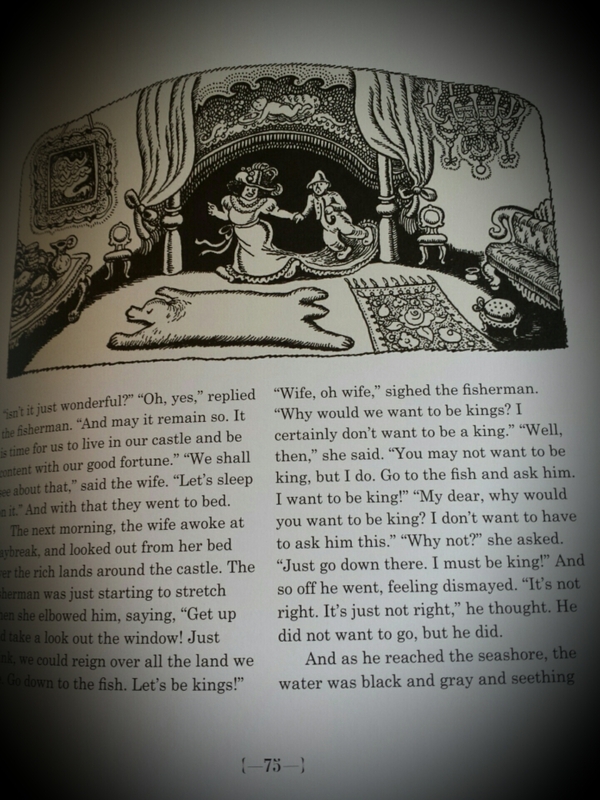 The first story I would like to start with is “The Frog Prince”. 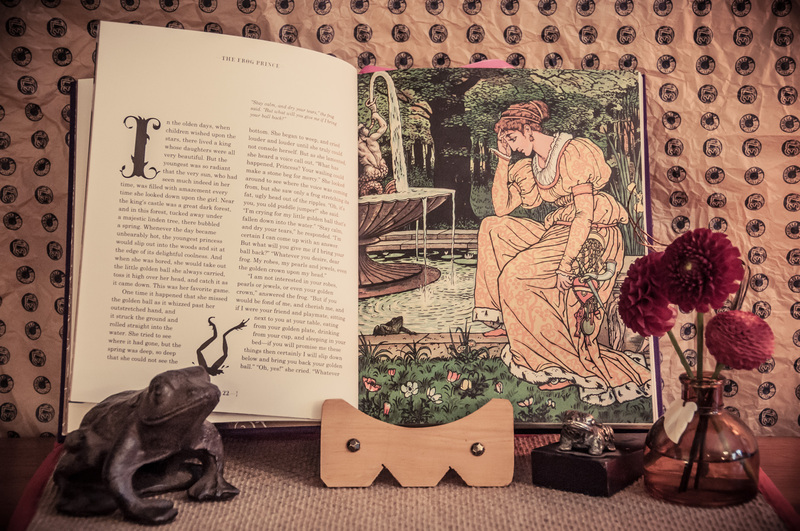 The “Frog Prince” according to Daniels dates back to a medieval Latin manuscript. The colored engraving featured above was done by Walter Crane in 1874. The illustration seen above captures the young princess and the frog as they bargain for a golden ball and friendship. The frog agrees to retrieve the golden ball that was accidentally dropped in a well. As for payment he requests not money, “But if you would be fond of me, and cherish me, and if I were your friend and play mate, sitting next to you at your table, eating from your golden plate, drinking from your cup, and sleeping in your bed-if you will promise me these things then certainly I will slip down below and bring you back your golden ball.” The princess flippantly agrees thinking she would never see the frog again. She gets her ball back and walks home. This story holds the obvious morals of keeping your promises and don’t judge too harshly before you know someone. But there is also a lesson about true love that is explained not between the princess and the frog prince, but from loyal Heinrich whose heart had to be bonded to keep from breaking apart when his prince turned into a frog. There is also a lesson directed to parents, perhaps the most important: Hold your children accountable to their promises and commitments. Note: If you would like to read the same edition I have, you can purchase it here. Literation is defined by Merriam-Webster as “The representation of sound or words by letters.” I know, I didn’t think it was a real word either until I looked it up. When I tell my friends the name of my blog they give me a funny look and inevitably ask, “Is literation an actual word? Do you mean alliteration?” Even as I type, spell-check is accusing me with its read squiggly line of making up the work literation, but I swear it’s real. Hopefully I didn’t slit my blog’s throat before it took its first breath by giving it an impossibly complicated name. Final argument: Scrabble recognizes it as a 10-point word.